Last summer, Langley teen Katrina Schulz realized a friend — who received free meals while in school — spent the weekends with little or nothing to eat. “While we were having pasta and salad and garlic bread and dessert for dinner, he had a granola bar,” said Schulz. The inequity was so awful that the 17-year-old, her 13-year-old sister, Emma, and their 16-year-old cousin, Brady Lumsden, vowed to fix it — three teens assuming responsibility for a social problem that should have been apparent to adults. From setting out to feed one boy, they soon discovered others in need. 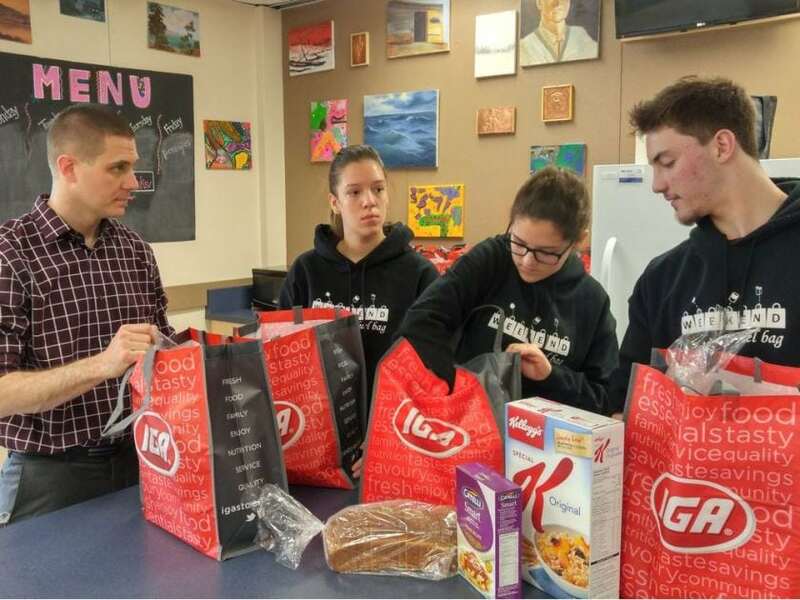 Now the trio are distributing 66 bags of food each week to seven Langley schools to keep students fed on weekends after waking up the community to the need. Each bag contains $10 worth of food, “two lunches, two breakfasts, two juice boxes, two fruit and a handful of snacks and a loaf of bread,” said Emma. Her cousin said it was a bit weird to find kids in Langley suffering from hunger. “You know about the problems overseas and you hear about kids in Africa not having enough to eat, but you don’t expect to find kids like this in your own neighbourhood,” said Lumsden. It takes some nerve to enter a supermarket and beg for food, but that’s how they started — going from store to store. In some, they were given one-off donations of juice or granola bars, but Buy-Low Foods in Walnut Grove gave them $100 and told them to come back when the money ran out. They did, but were frugal and produced bags containing about $5 worth of food. “We didn’t want to spend it on expensive food, but the cheapest food is usually the most unhealthy,” said Katrina. That Buy-Low closed a few months later removing their major benefactor, so they took their appeal to the local newspaper. The Langley School District Foundation took note and posted a link on its webpage allowing persons to donate to Weekend Fuel, as they now called their campaign. Save-On-Foods and IGA came forward as did Langley firefighters and donors such as A & A Contract Custom Brokers. It takes $660 a week to maintain deliveries and they have enough money to keep going until the end of the school year, with IGA committing $300 a week. The school that receives the most help is H. D. Stafford, a middle school on Grade Crescent in an area with social housing and a high ratio of refugee families. This school receives 20 bags a week and is an example of just what it takes to combat poverty in schools. The school has received $15,500 from The Vancouver Sun’s Adopt-A-School (AAS) campaign this year to pay for breakfast and lunch for 60 needy children each day. AAS is also giving $7,000 to build an outdoor eating area complete with tables, so students will have a place to eat instead of being sent back to class with their food on paper plates. “We want them to eat together and stay here — let it be a bit of a home,” said community school coordinator Brad Hendy, standing in what is a combined kitchen and recreation room with an old foosball and table tennis being its two main attractions. The $7,000 is being provided by a donation from Corey Mandryk and other union members of the United Steelworkers Unit 60, which has been matched by their employer, Shaw Cable. Mandryk was in the school meeting with Hendy to discuss the project last week when the sisters and their cousin arrived with bags of groceries. “I’m just blown away by what these young people are doing for other kids,” said Mandryk, who has supported AAS since it began five years ago. The trio believe there are other students that need help and worry that adult pride is getting in the way of some kids getting weekend bags. “Often it’s not the parents’ fault they are in that situation (of not having enough food),” said Katrina. “Something could have happened to their business or they could have been laid off. It’s not their fault, but it’s affecting their child, so we just want to make sure kids are getting the food they need and hopefully the parents will support that. What concerns them most is being able to maintain Weekend Fuel once the school year ends. “We are just hoping our donors will stay with us,” said Lumsden.